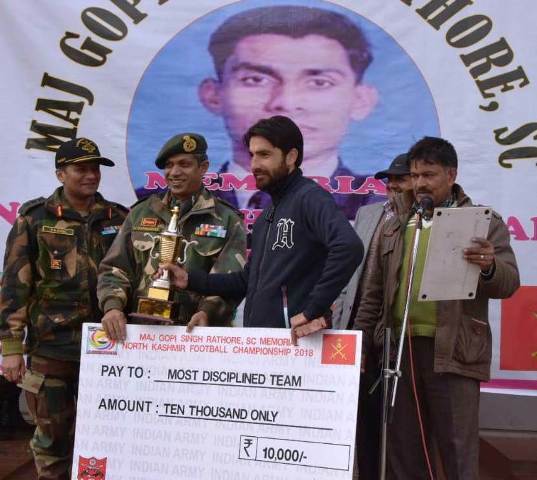 Srinagar, December 06 (Scoop News)-The final match of Army organised Maj Gopi Singh Rathore, SC Memorial North Kashmir Football Tournament 2018 was played at Sher-Kashmir-Stadium, Bandipora on 05 Dec 2018. The tournament had started on 03 Dec 2018. The technical assistance for the tournament was provided by the District Football Association, Bandipora. There were a total of 08 participating teams of various districts which were divided into two pools – Pool ‘A’ and Pool ‘B’. After having played the entire tournament on knock out basis, the unbeaten two teams Iqra FC Dachigam & Lahrwalpura FC A played the final on 05 Dec 2018. The tournament was played under standard International FIFA rules and regulations. The aim of the tournament was to identify fresh young football talent in the area and promote it further to higher level. The match was witnessed by a large audience and other dignitaries from Army, Police and Civil Administration. Following the event an award ceremony was conducted to felicitate the award winners.